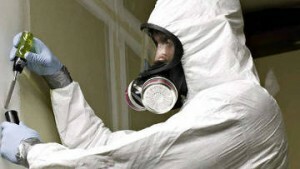 Need a Licensed Asbestos Inspector in Washington, D.C.? Planned renovations and structure demolition involving over 800 square feet both require the services of a licensed asbestos inspector in Washington, D.C. before the District Department of Energy & Environment (DoEE) will issue necessary permits to proceed with construction. That’s why construction contractors, property managers, businesses and homeowners rely on the asbestos expertise of Envirotex Environmental Services. The Asbestos Licensing and Control Act of 1990 and companion Amendment Act of 1993 provide for: asbestos inspector licensing and protections; asbestos emission controls with scientific measurements and environmental monitoring; and critical administrative and procedural protocols to ensure any work near or with asbestos is safely performed in compliance with all existing federal and District DoEE regulations. According to the District DoEE asbestos-containing material is fine if contained and undisturbed. However, when microscopic asbestos fibers are damaged and released through air or moisture, we can breath or consume the highly toxic asbestos fibers. Long-term asbestos exposure is directly linked by research to lung cancer, asbestosis, mesothelioma and gastrointestinal cancer. As a home, property, or business owner, hiring a licensed asbestos inspector in Washington, D.C. informs you of existing environmental conditions relative to asbestos and protects you from the risks, costs, and liability associated with long-term asbestos exposure. There are a host of individual mandates the DDoE requires to protect the public, property owners, and asbestos inspectors in Washington, D.C. For example, each asbestos inspector must obtain a medical examination along with completion of a safety training review course each year. Companies licensed as asbestos inspectors operating in Washington, D.C., must provide disposable protective clothing and respirators approved by the National Institute of Occupational Safety and Health. All tasks related to asbestos services are carefully regulated, documented, and monitored in accordance with OSHA regulations. So, when you need an experienced, fully-compliant asbestos inspector in Washington, D.C., contact the licensed, experienced asbestos inspectors at Envirotex – providing safe, meticulous, and accurate inspection, testing, abatement, and asbestos removal for satisfied clients in Virginia and Washington, D.C. for over 15 years.